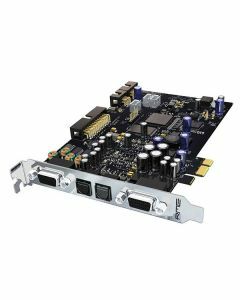 RME presents the world's most versatile PCI Express audio interface - the HDSPe AIO. This card makes the dream of an All-In-One solution for every possible application come true. The Advanced-Input-Output interface shines with the latest 192 kHz AD- and DA-converters, with more than 112 dB signal to noise ratio. For the first time, all inputs and outputs are simultaneously operational, even SPDIF (phono) and AES/EBU (XLR). Additional hi-quality analogue inputs and outputs can easily be added by favourably priced expansion boards. Of course TotalMix, the unsurpassed flexible routing mixer and SteadyClock, RME's sensational clock technology with maximum jitter suppression of external clock signals, are on board too. HDSPe AIO also supports the optional TCO for synchronisation to timecode (LTC/video). All this combines into a professional 'soundcard' that the world has not seen before. * The HDSPe AIO ships in a basic version with analogue RCA/phono breakout cables (headphone: TRS jack). Therefore all analogue I/Os are unbalanced. An analogue XLR breakout cable is available as option (headphone: Neutrik TRS locking jack), turning analogue into balanced mode.